5% New customers discount Code: "neu"
DOG FIT by PreThis® - We are for over 10 years your expert shop for dog health! Natural health supplements for dogs of all sizes and breeds! 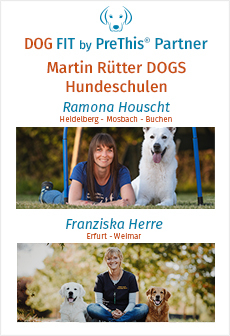 At the DOG FIT by PreThis® Onlineshop you find very high-quality products for the vitality and health of your dog. For more than 10 years we work in collaboration with healthcare professionals for an optimal and inexpensive range of supplements for our pets. You be convinced of our products and already received as a new customer a great 5% discount on the entire product range! Many dog owners are willing to spend time, love and money so that it makes their beloved dogs life well and to invest in: Visiting a dog school, active employment with the dog, good dog food, as well as an adequate supply of brushes, tableware, linen and dog bed are now fortunately standard for most dogs. When it comes to the quadrupeds being unwell yet again, it is often of big concern and a visit to the vet is advised. Here, the dog needs customized dietary supplementation with the preparations of DOG FIT by PreThis® hich prevent many health problems. The products of animal nutrition supplementary series DOG FIT by PreThis® has been specially tailored to the needs of dogs and have been developed with respect to several common diseases and deficiencies according to strict medical standards. Especially when pre-existing conditions, hereditary tendencies or even increased loads are known, an optimized nutrient supply promotes the health of the dog and to receive good services. This Supplementary food can act as food, they must be tailored to the specific health problems of the affected dog: DOG FIT by PreThis® provides the example of the joint health of the dog with a wide range of different products that are dosed depending on the dog\'s weight. This allows the targeted treatment for osteoarthritis or arthritis, age-related joint problems but also to damage by deformities of the dog. Depending on the type of joint problems, see the DOG FIT by PreThis® JOINTS joint products the right product: DOG FIT by PreThis® JOINTS greenshell, DOG FIT by PreThis® JOINTS collagen or DOG FIT by PreThis® JOINTS (small, medium & large) provide help with age-related joint disorders, stress-induced joint pain, and also for the prevention of future joint damage. If in addition to the joint problems more health defects occur, then DOG FIT by PreThis® CARE is the right choice: The All-in-One product works through its special combination on both joint health, as well as skin and coat, as well as on eyes, digestion and metabolism positively. If the problem focuses primarily on Skin & Coat, DOG FIT by PreThis® SHINE supports a healthy appearance. In collaboration with experienced veterinarians DOG FIT has also DOG FIT by PreThis® IMMUNE designed to strengthen the body's defenses and DOG FIT by PreThis® VITAMIN B for a powerful nervous system and an active metabolism. The product range is complemented by the effective products DOG FIT by PreThis® FRESH and DOG FIT by PreThis® WHITE for healthy teeth and a pleasant breath in dogs. The supplementary feed of DOG FIT by PreThis® CARE senior can make a valuable contribution to keep your dog healthy and agile into old age. With highly concentrated and perfectly matched ingredients that DOG FIT by PreThis® products provide ideal effect with efficient. Order DOG FIT Products now! Best price guaranteed! Your well-being and vitality of your pets is important to us and we as experts be a healthy lifestyle which we resembled se do r that they and your pets fit into old age and vital choose. View our health products offer in our shop. 5% new customer discount code: "neu"
Subscribe to the free newsletter and ensure that you will no longer miss any offers or news of DOG FIT by PreThis® Shop.